Better support for sudo. Now KDE Partition Manager declares required environmental variables when kdesu uses sudo (e.g. in Kubuntu or Neon), so the theming is no longer broken. Environmental variables for Wayland are also fixed. Here is a video demonstrating some of these new LVM capabilities. Note this is done directly from my main system, I’m resizing my encrypted rootfs without using any Live CD. LVM Physical Volumes. These are partitions on disk devices that are allocated for LVM. The union of LVM PVs is LVM Volume Group. LVM Volume Groups. These are more or less equivalent to devices that can be partitioned into LVM Logical Volumes. LVM Logical Volumes. These are similar to like your normal partitions but stored in LVM Volume Group instead of normal disk. These 3 LVM VG operations are hidden in the menu of normal disk devices. Keep “New Volume” in the Device menu and show it for all devices. Move “New Volume” operation into the context menu of LVM PV partition (e.g. where operations like mount, unmount, resize partitions are located) and only make it visible for LVM PV file systems but not other types. Option 2 will have LVM VG operations split over 2 places, but on the other hand it seems to me that option 2 might make more sense logically. Also, I’m a bit scared that creation of new LVM VG group might be a bit hidden. I would be very grateful for any feedback (especially from Visual Design Group). E.g. which option would you prefer. Also, do you think we need another icon for LVM devices? At the moment we are using drive-harddisk but having some other icon for virtual devices might be nice. Much improved LUKS support. We used to just detect LUKS container. Now KDE Partition Manager can create LUKS volumes and format inner file system. Since default options are used (except for the key size which was increased) we recommend cryptsetup 1.6 or later. At the moment we restrict the choice of new inner file systems to ext234, Btrfs, swap, ReiserFS, Reiser4, XFS, JFS, ZFS and LVM physical volumes when formatting new encrypted partitions but if you create other file systems manually using command line tools they will still work in KDE Partition Manager (other than detection support for LVM PV, the support for LVM is not implemented but this might change soon as a result of GSoC project, there is already some LVM PV resize support in git master). If you think it makes sense to whitelist other file systems and there is a valid use case please leave a comment. LUKS volumes can be opened/closed. Resize support for filesystems encrypted with LUKS (obviously you can’t do this while LUKS volume is closed, you have to decrypt it first). To the best of my knowledge, no other partition manager can do this. To prevent data loss, you can only move LUKS partitions that are closed. 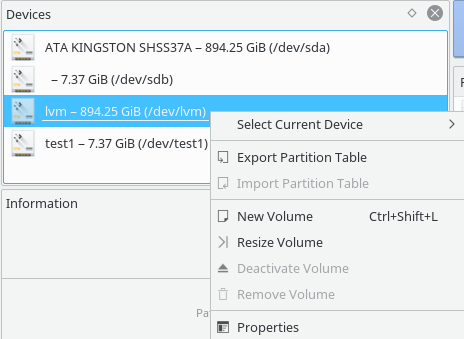 A few bugs were fixed in KDE Partition Manager to properly support unmovable but resizeable partitions (i.e. LUKS when it is closed). Filesystems inside LUKS can be checked for errors, mounted, labels can be set, etc. All other stuff like free space reporting also works (and space taken up by LUKS metadata is taken into the account). Opened LUKS partitions now cannot be removed, you have to close them first. Copying LUKS partition works but only when they are closed. More widespread use of C++11 features. Clobbering (deleting file system signature) deleted partitions was fixed. Some other bugs were fixed, e.g. NILFS2 resizing support was fixed. ntfslabel from ntfs-3g is now used for setting NTFS labels. A crash when partitions were deleted (mainly extended but not only) was fixed. Compilation with Clang was fixed. There is also a slightly older (e.g. now we use KPasswordDialog to unlock LUKS partitions) video demonstrating LUKS support. Note for packagers: Calamares 2.2.2 will most likely work with KPMcore 2.2.0 after recompilation but Calamares 2.3 will be recommended as soon as it is released. Older versions of KDE Partition Manager are not compatible with KPMcore 2.2.0, so you need to update KPMcore and KDE Partition Manager at the same time. Qt 5.6.1 also fixes one minor NTFS bug in KPMcore but unfortunately it is not released yet. There are already packages for Arch and Gentoo, hopefully other distros will package it too. I’m happy to announce new versions of KDE Partition Manager 2.1.0 and KPMcore 2.1.0. F2FS support (requires f2fs-tools). The support is fairly minimal, e.g. no resize support due to the current limitations of f2fs-tools. Bring partition flags support up to current libparted level. Edit: KDE Partition Manager 2.0.3 is now released to fix a crash in settings dialog (it can be used with KPMcore 2.0.x but please use the latest KPMcore 2.0.1). I’m happy to announce KDE Partition Manager 2.0.0 and the first stable release of KPMcore. This release mostly focused on splitting user interface and partitioning library which will be used in the next release of Calamares. It also brings some bugfixes but unfortunately I wasn’t able to go through all reported bugs in bugzilla yet (but they don’t seem to be regressions). I am happy to announce that upcoming release of KDE Partition Manager is split into library (KPMcore) and GUI parts to allow other projects reuse partitioning code. KPMcore is already used by the development versions of distribution independent installer Calamares whose maintainer Teo Mrnjavac contributed a lot to help get this release of KDE Partition Manager out. In the meantime you can download and test alpha versions of KPMcore and KDE Partition Manager. KPMcore library is also licensed under GNU GPLv3+ (it links to parted which is GPLv3+).